What has Finn Wolfhard been doing in between shooting Season 3 of Stranger Things and touring with his band Calpurnia? Hanging out with Weezer, of course! 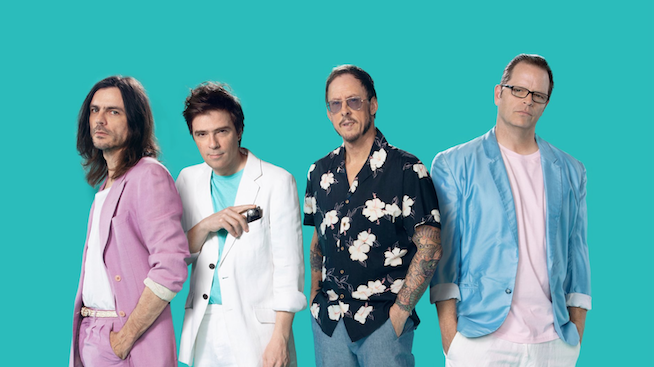 Recently, Weezer surprised fans with the Teal Album, a collection of covers everyone knows and loves, including A-Ha’s “Take On Me”. Weezer teamed up with Wolfhard and his band for the video in which Wolfhard stars as a teenage Rivers Cuomo. The imagery is delightfully ’80s, and even pays tribute to A-Ha’s original video, complete with illustrated scenes of the band. This isn’t the first time Wolfhard has played a young version of Rivers. In 2017, he was on the show Lip Sync Battle, performing “Buddy Holly”. If things continue this way, maybe we’ll see Wolfhard starring as a feature role in a Weezer biopic film? Stranger things have happened! Check out the video below and catch the new season of Stranger Things this July!